The holiday season is just around the corner. Gather your shopping stamina and holiday cheer, and check out the best markets the area has to offer. The festive outdoor Downtown Holiday Market has returned to 8th and F streets NW, featuring more than 150 local artists, crafters and small businesses. Rotating daily, 60 vendors will offer gifts such as jewelry, pottery, paintings and textiles. You'll also find food vendors (think hot donuts!) and live entertainment. Friday, Nov. 28-Tuesday, Dec. 23; noon-8 p.m.
Modern light displays and public art will dominate the first-ever Georgetown GLOW exhibition. 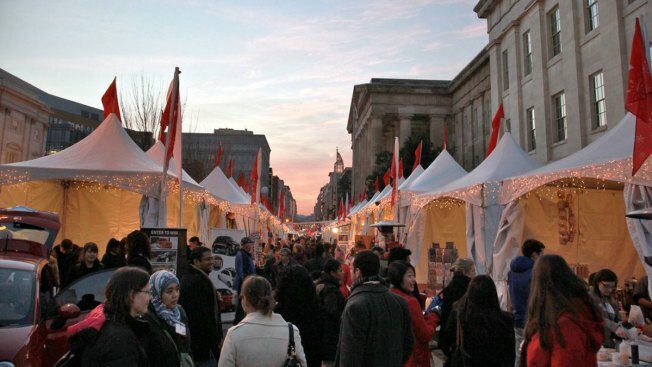 Stroll down an M Street transformed by lights, and view works of art from local, regional and international artists. You'll also find art along the the Book Hill Park area of Wisconsin Avenue, as well as at Washington Harbour and office buildings south of M Street. Many Georgetown stores and restaurants will run promotions throughout the weekend. Friday, Dec. 12-Sunday, Dec. 14. Embrace the holiday spirit at the Smithsonian Holiday Festival, which will offer musical performances, films, book signings, apparel and jewelry trunk shows, and family craft activities throughout the museums. Saturday, Dec. 6-Sunday, Dec. 7, varying times and locations; see complete schedule here. Inspired by traditional German Christmas markets, Tysons Corner Center will host their second annual Christmas Market (1961 Chain Bridge Road, McLean). For 20 days, shoppers can explore 20+ exhibitor booths and a large tented pop-up store for Käthe Wohlfahrt, a German merchandiser. Tysons' Winterfest 2014 will also feature a Christmas tree, ice skating rink and beer garden, as well as outdoor seating around fire pits and entertainment. Friday, Dec. 5-Wednesday, Dec 24, 11 a.m.-9 p.m., ending at 4 p.m. Dec. 24. For its fourth year, the GRUMP Holiday Arts & Crafts Show (Artisphere, 1101 Wilson Blvd., Arlington) will feature 75 local vendors, selling everything from locally designed T-shirts to handmade soap. In addition to shopping, you'll find a make-your-own-gift craft station and a gift-wrapping station. GRUMP will also offer kids a gingerbread history lesson, cookie decorating and ornament making, and will air repeat screenings of "How the Grinch Stole Christmas." Sunday, Dec. 14, 11a.m.-5p.m. The Del Ray Artisans Fine Art & Fine Craft Holiday Market (Nicholas A. Colasanto Center, 2704 Mount Vernon Ave., Alexandria) will feature pottery, jewelry, glass, cloth and paper from local artists. You'll find different vendors and free refreshments each weekend.Fridays through Sundays until Dec. 21: Fridays 6-9 p.m.; Saturdays 10 a.m.-4 p.m.; Sundays noon-4 p.m.
More than 90 artisans will showcase handmade jewelry, woodcraft, textiles food and other products at the Fine Arts and Crafts Show (Ida Lee Park Recreation Center, 60 Ida Lee Drive NW, Leesburg). Saturday, Dec. 6, 9 a.m.-4 p.m.; Sunday, Dec. 7, 10 a.m.-4 p.m.
Stay warm while shopping for gifts at the National Harbor Holiday Market with hot chocolate and other winter treats. On Saturdays, the market (201 Waterfront St., National Harbor) will offer festival carousel rides with Santa and carol performances. Weekends through Dec. 21, noon-5 p.m. Charities will offer new ideas at the Takoma Park Alternative Gift Fair. These are gifts that give back: Past events have offered gifts like training kits to educate a rural women's group to produce clean fuel charcoal briquettes ($10) or a month of fresh, local vegetables for a low-income family ($40). You'll find the fair at the Takoma Park Presbyterian Church (310 Tulip Ave., Takoma Park). Saturday, Dec. 6, noon-4 p.m.